Did I mention how much I enjoyed working for the Ministry? It was a joy. I really mean that. I thought it was so great to be able to do something that supported Grant and Jane Clarke and Gregg Hake in their quest to restore the whole world. In fact, I was so willing to do this that I broke at least one law myself and allowed them to also break at least one law! I did this as a devoted servant, and never in my wildest dreams did I ever feel I would create this post. Unfortunately, the Grant and Jane Clarke and Gregory Hake I worked for are not the same people I know now. I am not saying that they changed; I am saying they are showing a different side of them now. The Lodge at Deerfield: Before and After. Expensive renovations were undertaken to make the Lodge a Deerfield look very different, from the isolated and secret compound serving as the Ministry of Spirit of Truth headquarters just couple years ago to Energetix and One Company Resources headquarters now. The first months I “worked” with them, I was not on record as being employed. I did that to avoid the company (One Company Resources, or OCR for short) to pay anything more than needed. I instead lived off of unemployment from my previous employer and any savings I had. I was happy to do that. Sure, I was given food and lodging as well. And I will say that I enjoyed the food, even if it did have more vegetables than I was used to. As for the lodging, well, I don’t know how to compare it. Have you ever lived in a college dorm? Remember how tiny the rooms were and how little you had in it? This was worse. I had a little room. I moved from room to room frequently based upon need. Many of the rooms did not have a bathroom; I would go across the hall to get to the bathroom. None of the rooms had a phone or cable connection. To connect to the internet, there was one TINY little office on the bottom floor where there was a phone line. Oh, and I had NO KEY to the place. Different couples at different times were living at Deerfield apartment (now Creative Field Media offices) as gatekeepers. I could not come and go as I pleased. Well, I could, I just needed to be back by 11 pm before they locked the doors. Sure, there was always a person (or couple) living in an apartment there who had a key. Man, the apartment was super nice! It had a full kitchen, dining room, living room, bedroom, its own bathroom, cable, telephone line for both telephone use and internet connection, and its own private entrance! I would have loved to live there instead of any of the other little rooms. Getting back to the point, I could have always knocked on the private entrance to get in if the front door was locked; I cannot prove this, but I have a feeling the person living in the apartment likely told one of the Clarkes or Gregg whenever anyone was late. Then there was the pay. I got paid super little. Really. People can complain about their pay, but let me ask you this. How many of you got paid less than $15,000 per year? For about four years straight? Not only did I get paid little, but my pay went down as time went on. The reason for that is because we were paid based upon need, not by any other standard like worth. I had a few bills, so I needed very little. Some of those bills got paid off (like student loans), so that helped my pay go down. On top of the need pay, I also received $200 per month for spending money. After one Sunday service, everybody in the ministry hung around the South garden building to listen to Gregg Hake speak about wondering if everybody was doing everything we could do to financially support. I thought I was doing enough by only accepting $200 per month for spending money, but I decided to see if I could do better. I was inspired by what Gregg said and decided to cut my pay request by $100. I suddenly went to having half the extra money I did before. I will admit it did give me great discipline in spending money. It also put me in quite a bind if ever I needed anything. 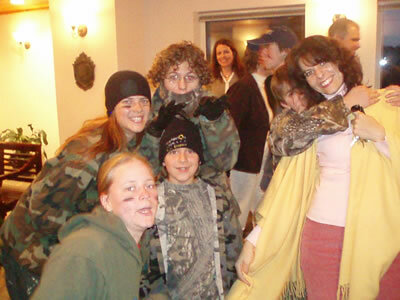 The Lodge at Deerfield was a great place for the kids, here ready to play night games. It was very hard for kids to discover what was really going on there. I remember having to personally ask Jane for money for clothes. My clothes were years old, torn, and need of throwing away. I simply did not have enough to buy new ones. It’s not that I wanted fancy or expensive clothes. I shopped at places like Target. The problem was, without asking for something extra from Jane, I would not have been able to afford inexpensive Target clothes. That was my situation. At the time, I never judged them for the clothes they had. Jane’s clothes looked like they came from Neiman Marcus (or Needless Markup as I call it). They were the garish type of outfits that only rich people would wear to show off in front of you how much they knew that they were better than you. I can assure you, Grant Clarke and Gregory Hake never bought clothes from Target. But that was okay. They were doing more for the Lord than I. They were also “closer to God” than I thought I was. This is what we all were thought to believe. By the way, the place where I lived? The address is 209 West Deerfield Lane in Dahlonega, GA. It is now the offices for Energetix, Creative Field Media, OCR, and Gregg Hake. I used to eat my meals where Energetix practitioner support and customer care work. I lived in most of the offices there. The office for the two accountants is where we would sometimes hold evening services whenever there was a class. 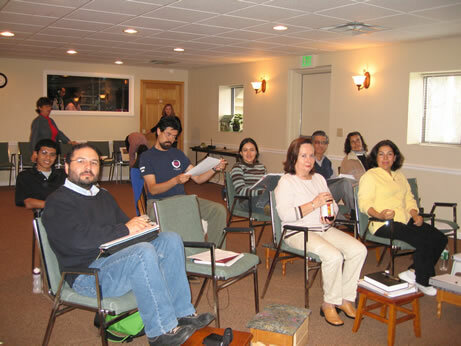 The large meeting room and Body Sanctuary Yoga Studio was the place for Sunday services. They are trying their best to cover their tracks. Different cult, but I write about my memories of growing up in a cult, as well as being married to a polygamist. I’m not a mother of six children and I am sorting out what happened. who I am now and where I am trying to go. I read about the cult you were in. Your cultist Tony Alamo is not a good man. Prison seems like the right place for him. I saw an interesting term on his website that he uses to describe the people who testified against him for the Feds. Instead of being brainwashed, they were brain-dirtied. Sounds like the typical sociopath to me. Glad to see you are moving on. Good luck. Oh, so many ‘SACRED’ things were held at The Lodge at Deerfield: Wednesday and Sunday services, dinners 7 days a week, Saturdays’ lunch (after “work pattern”/ free labor) and Sundays’ lunch (after service). The Classes were also very sacred and even though the classroom/Chapel/ yoga studio (nowadays) had the door closed, everybody who entered the lodge had to be extremely quiet and careful not to disrupt that atmosphere, not even with a sneeze! The nice women who cooked all of the meals for the class participants couldn’t even enjoy their assigned job in the kitchen, because any laugh or any “inappropriate” (one of the leaders’ favorite words) noise would make them be in trouble. So many wonderful classes! To name a few, there were: Handling Stress, Attunement, Art and Science of Living, Behold and Create and Divine Design of Man #1, 2, 3, 4 & 5. When the Energetix seminars were at the Lodge (or 209 Building), remember how we couldn’t show up anywhere near? 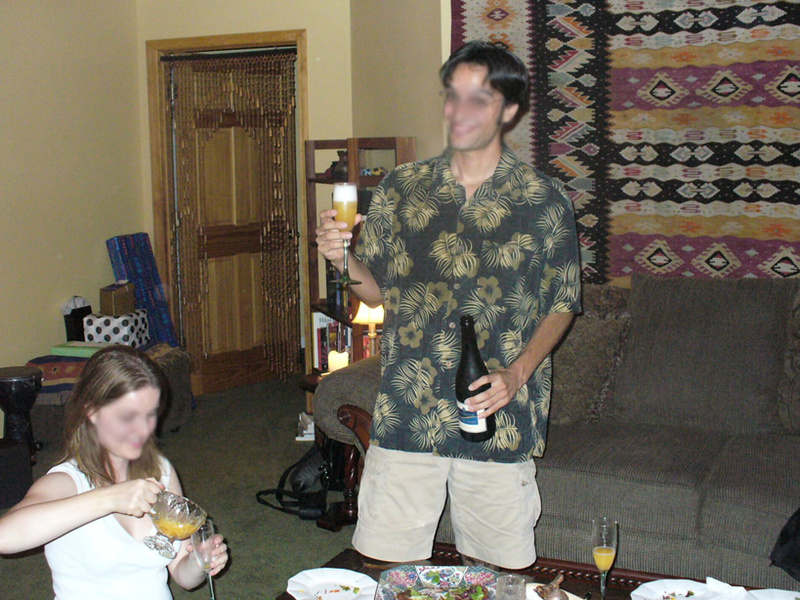 If working at the kitchen or helping cleaning and setting tables in the dining room (now Energetix Client Care and Practitioner support offices) we had to pretend we were normal employees, people from the world, and erase our joyful cultish smiles. I remember taking a couple day class geared toward the kids of the group. This was shortly after the lodge was built. I just remembered the many hours of Nut-Man work I did as a 13 year old. I was there at the lodge at least 5 nights a week for dinner also. I remember going to services down in Atlanta before the lodge was built. My Dad was looking for a resource like this site for years after Grant fired him. I’m glad you mention how much you enjoyed working for the Ministry because it is very important to notice that when we were working for Gregg Hake and Jane and Grant, we loved it, we enjoyed it, we rejoiced and were thankful for the opportunity. We loved to be under their dominion and influence and we even felt superior because we were doing all of this for the Lord. When we arrived in September 2005 we were put to work the next day and we were working 6 days a week with no salary until March 2006. Not only that, we were asked to use our savings not only to support our family during all those months but to support two other employees of the company. I have Gregg’s e-mails, he said it had something to do with taxes. And we believed it. 4 of us worked for 6 months without payment, 6 months a week, we drained our savings, but we felt honored, we felt that we were being an example to others. Even when the community meals stopped and we started to be treated like normal people with vacations and wages instead of the Pay Per Need system, we worked much more than the non cult employees and it was an honor, a delight. The historical houses in this town are visited by hundreds of people on the first Sunday in December. I remember the staff at the Spa on Green Street hated this event, but I was so happy, I was not paid any extra hours, it was cold and we had to be well dressed, in high heals going up and down the stairs standing up for hours before the event and after…. But I was happy, because I was serving the Lord. Who was the Lord? The Lord was represented by Gregg Hake, with his lean body, “sincere” smile and powerful eyes, he represented all that I wanted to be at some point, that perfection that I could never attain. He was the symbol of perfection, he was the symbol of someone who could handle every detail big or small in a perfect way. He had something else that made him mightier, he was the father of Christopher. For 3 weeks in 2005 I and other “privileged” people, among them Kate Porfilio, Susan Horn (now Susan Boye) and Chuck Reddick, were at a very “sacred” class to receive the coming on earth of this “very special being” – Gregg’s Son. Is he the incarnation of Jesus? Is he the incarnation of the Spirit of Truth a.k.a Uranda? Everybody speculated on that, but Grant told us that he did know who Christopher is, and that we needed to know that Christopher came here to complete the restoration process. For some reason, Melissa Hake gave me a picture of Christopher, a picture that until July 2006 I still kept in my “altar” with a candle nexto to Uranda’s picture. So, yes, I loved to work extra hours, to not being paid for 6 months, to do whatever Gregg would tell me and to accept his rebuke that I was not doing enough, Gregg was God for me. Now that I read that our good friends who still work at Energetix Corporation, write those beautiful words of response to him on his blog, I don’t blame them, Gregg is their God, Gregg is the father of the incarnation of Jesus or Gabriel. (The name of Gregg’s son is Christopher Gabriel). Yeah, I don’t blame his followers either. We’ve all been there, thinking that Gregg was the wisest, the greatest and the most caring honest man (three characteristics that couldn’t be more far away from reality). So, they ended up making Ricardo marry Susan (or vice versa)?? Interesting couples in the MST Energetix cult, huh? It must be to make sure he stays there, within the “core” family, without concern to be paid what he REALLY deserves. He was a very succesful doctor in Texas, before he joined the Cult. Now he is Gregg’s lapdog, living where he is told to live, and doing what he is asked to do. But he is happy with that, so all is good, I guess. But I was also happy. The problem occurred when it was discovered that what I thought I was working for was a lie. Is Ricardo working under the same pretense as we were or does he truly understand what he is in the middle of? You are right, we started noticing more and more that all was a lie. Many people left before things were so evident, obvious and clearly cruel. Ricardo, who is still there, does know what’s going on, he does know what Gregg has done to people (including his friends and former girlfriend), and he did see the same atrocities we saw. Some of us were shocked, we were sick of that, disgusted by the unethical situations we saw, so we finally woke up and left! But some others, like this doctor, seem to have a different understanding, that’s all! We don’t know what’s going on in their heads. Maybe these ‘loyal’ people have an identity problem and don’t want to leave because they would feel lost and don’t know how they can function in the world; maybe they are bombarded by amazing attention and fake display of care by the cult leaders which makes them feel important and worthy. The fact is, we all saw the same things, but there are greed, fear and shame- feelings that make one stay or even leave (but keep quiet). Speaking of getting paid what one deserves, I remember a speech Chuck Reddick was giving at an Energetix event. He was speaking to these practitioners about the business side of things. Chuck said that you should pay somebody what they are worth, even if they are willing to accept less than what they are worth and what you think the position is worth. What does that say about the worth Gregg Hake puts on his employees? Different cult, but oh so similar. I’m at a loss for words, but not feelings…in my gut and in my heart. I appreciate you sharing your experience here. I read the terms you posted on a previous post and loved them. By reading our story and sharing with us your experiences, I hope it helps to cleanse everything emotionally. It also helps to legitimize our experience here. It shows that Grant and Jane Clarke and Gregg Hake (and other supporters and enablers) did something that was not only cruel, but also well planned, intentional. It is not a coincidence that we have similar experiences. It is not a coincidence that Gregg Hake, a man who was virtually invisible until this blog was created, now wants to flood the internet with other “inspiring” information, trying desperately to hide this blog. None of this is a coincidence. Your words are wonderful and always appreciated. Thanks so much! Anti-Christian Communist Cult in Northeast Georgia??!? Wow, I remember the lodge being built. I was 12 at the time. I use to do all kinds of work on that property. I mainly cut grass during the summer months. Once the lodge was built, I helped doing dishes in the kitchen. My Father worked for Energetix before he was fired for confronting Grant an Rob about cult-like things that were becoming more and more clear to him. Grant and Rob became very defensive, almost as if my Dad was attacking them. I put this whole thing out of my mind for years and stumbled across this site today. Thank you for sharing your comments here! Glad to see that your father was able to see what was really behind these companies and non-profits and you were lucky to leave Deerfield on time. A lot of people suffered the effects of this scam, lot if people lost everything from 401(k) plans to families and many of them are still afraid to talk. Please share more about what your father saw in 2002 that most of us ignored or were already so brainwashed that were not able to recognize!